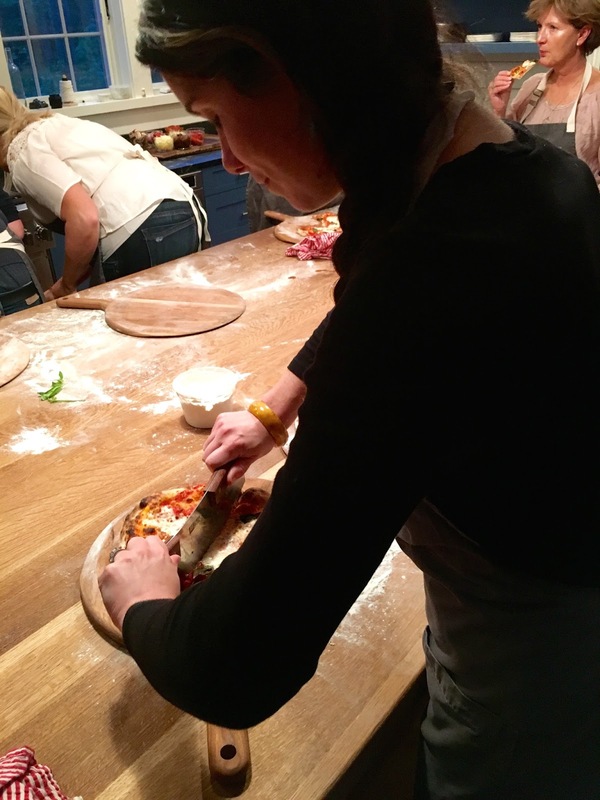 Last Thursday, we took a mini excursion to the other shore, Cohasset, to learn the secrets to crafting a beautifully charred Neopolitan-style pizza. The pro? Andris Lagsdin. A few years ago, Andris was reading Nathan Myhrvold ‘s Modernist Cuisine and discovered that the best conductive cooking surface for pizza is steel. Coincidentally, Andris was working for a family-owned manufacturing company, Stoughton Steel, so decided to create and sell baking steels. He quickly generated an extensive following and garnered acclaim in such sources as Food and Wine, Bon Appetit, and Cook’s Illustrated. Due to the steel’s conductivity, the pizza cooks faster and more evenly resulting in a thin, crisp crust in a matter of minutes. Upon entering the state-of-the-art Test Kitchen, we were handed an apron and glass of wine. 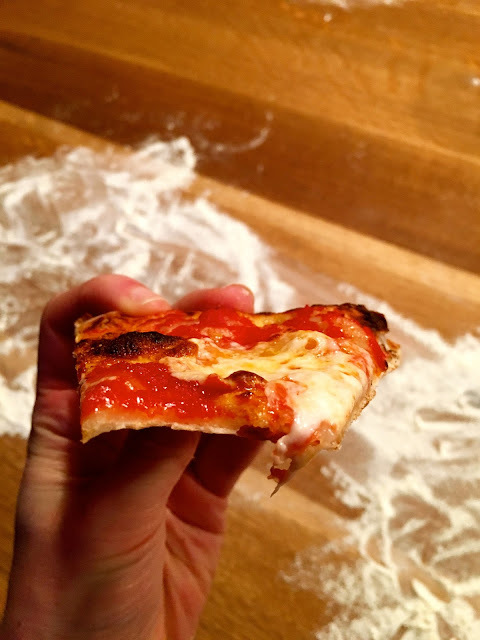 The incredibly warm and friendly Andris and fellow chef, Craig Hastings discussed their passion and “less is more” approach to pizza making as we nibbled on provolone, ham, soppressata, and jalapeno stromboli slices straight from the baking steel. Andris swears by Jim Lahey of New York City's Sullivan Street Bakery’s No Knead Pizza Dough recipe. He uses just four ingredients: flour, salt, water and yeast. After combining the ingredients, the dough sits at room temperature for 24 hours. After 24 hours, the risen dough is portioned, smoothed into balls, placed in plastic cylinders, and set to ferment for another 48 hours longer in the refrigerator. The full set of instructions are HERE. After watching Andris gently stretch out some previously fermented dough, lay it on a floured wood paddle, spread a thin layer of tomato sauce (which was a mix of crushed tomatoes and salt) followed by a sprinkle of fresh mozzarella cheese mounds, basil leaves and a drizzle of EVOO, it was our turn to make our own Margherita pizza. When our pies (some rounder than others) were ready to bake, we took turns opening the oven doors and sliding the pizzas onto the baking steels, preheated an hour earlier at 500 degrees Fahrenheit. 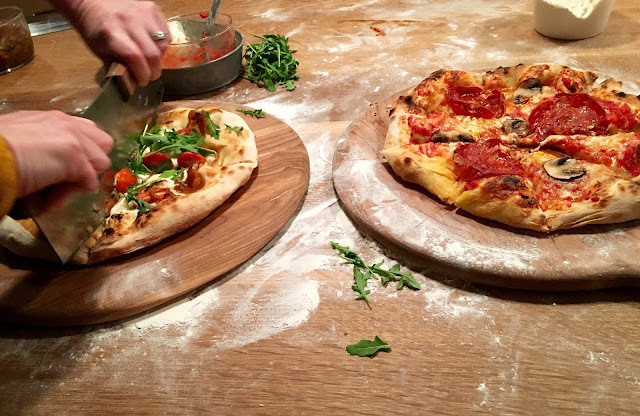 We watched the pies bubble and crisp away as we each made a second pizza, this time with an abundance of toppings. 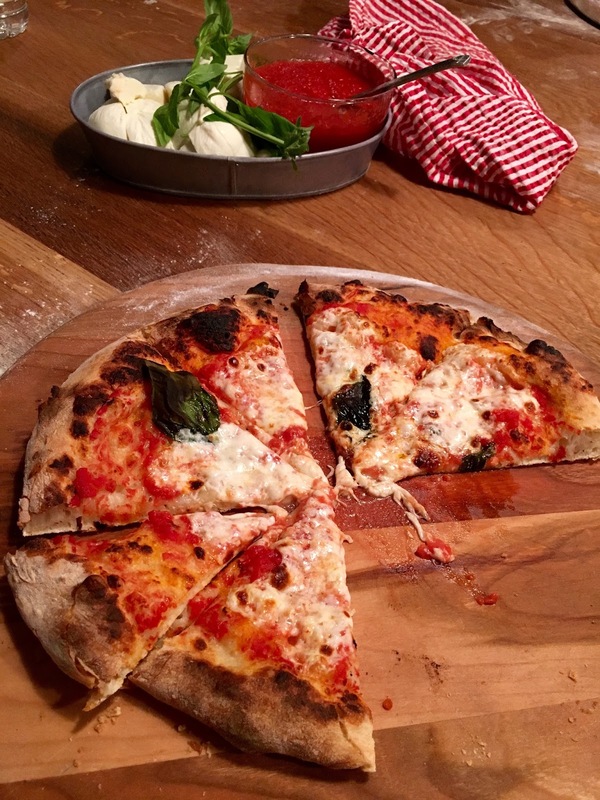 The first bite of Margherita transported us both back to Italy. The dough was crisp, had a wonderful, chewy interior, sporadic charred bubbles, tangy sauce, gooey mozzarella, and the lovely basil aroma. It was pure bliss. We left with pizza boxes full and with our prepared dough for future pizza making. 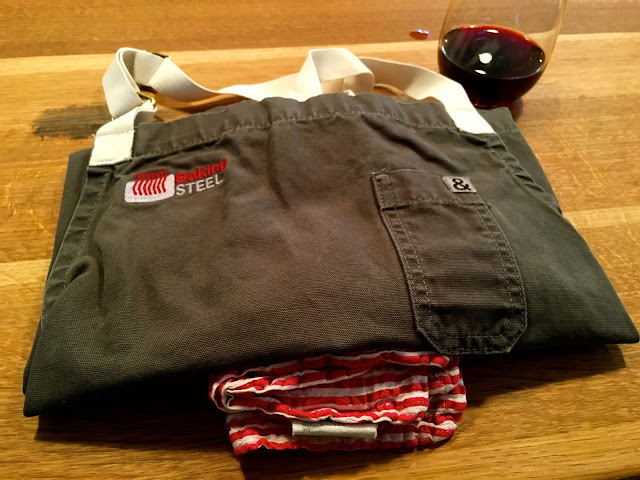 We highly recommend Andris' cooking class and look forward to trying the baking steel at home - check out all of its uses HERE!